AND THEATRICAL VERSION OF THE MOVIE, PLUS ALL NEW EXTRAS! Pre-Order This Must-Have Collector's Edition Today! In the world where magic is real, death is the ultimate illusion. From best-selling author and celebrated director Clive Barker comes a supernatural thriller that rips apart the boundaries between sanity and madness, and between the art of illusion and the terrifying forces of magic. Written and directed by Clive Barker (Nightbreed) and based on his popular short story, The Last Illusion (from Books of Blood Vol. 6), the 1995 cult film classic Lord Of Illusions stars Scott Bakula (Quantum Leap), Kevin J. O'Connor (The Mummy), Famke Janssen (X-Men, Taken, Hemlock Grove) and Daniel Von Bargen (Crimson Tide, The Faculty). On December 16, 2014, SCREAM FACTORY(TM) is proud to present Clive Barker's LORD OF ILLUSIONS Collector's Edition 2-Disc Blu-ray Set on home entertainment shelves everywhere. Arriving for the first time on Blu-ray(TM), this highly anticipated release contains both the theatrical cut and ALL NEW high-definition transfer of Clive Barker's DIRECTOR'S CUT of the movie, insightful bonus content, as well as a collectible cover featuring newly rendered retro-style artwork, a reversible cover wrap with original theatrical key art. 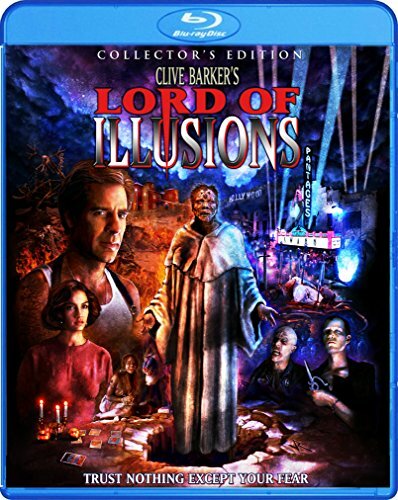 A must-have for horror enthusiasts, movie collectors and fans of Clive Barker, Lord Of Illusions (Collector's Edition) Blu-ray is priced to own at $29.93 SRP. Scott Bakula portrays Harry D'Amour, a private detective visiting Los Angeles on a routine investigation. Harry gets more than he bargains for when he encounters Philip Swan, a performer whose amazing illusions captivate the world. But are they really illusions? Harry isn't so sure as he is thrust into a nightmare of murder, deception and terrifying assaults from the dark beyond. Famke Janssen and Daniel von Bargen also star in this cult film classic. CLIVE BARKER'S "LORD OF ILLUSIONS"
Shout! Factory will continue to present the on-going SCREAM FACTORY(TM) home entertainment series in 2015 with specific release dates, extras and key art. Meanwhile, fans are encouraged to visit the Scream Factory main website (www.screamfactorydvd.com), follow them on Facebook (www.facebook.com/ScreamFactoryDVD) and Twitter (www.Twitter.com/@Scream_Factory) or to view exclusive video content on YouTube (http://www.youtube.com/user/ScreamFactoryTV/Home).